We're not quite sure how a year has already slipped by since our friend Melissa started Bella Sunshine Designs (afflink, hereafter marked with *) but we're happy to be here for the celebration! 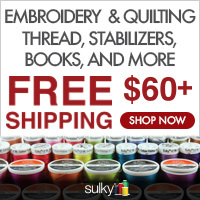 See what Rebekah and Chris did when they got the opportunity to mash up some Bella Sunshine patterns and be sure to take advantage of the huge SITEWIDE SALE* where you can get 40% off all patterns through February 29th so you can get your sew on too! Visit the Bella Sunshine birthday blog to see who else is posting today! First of all, a big HAPPY BIRTHDAY is in order for Bella Sunshine Designs*! To celebrate I wanted to create something spectacular using some of the awesome patterns she has created so far. A vision came to mind when given the challenge to transform or mash up her patterns. 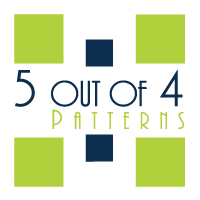 Why not take the elements of several patterns and create an amazing look? Of course, I couldn’t just leave it at that could I? I added another level by making it all in knit! And this spectacular knit came from A Purple Seamstress Fabrics. Such awesome knit to be found there. With the combo of these fabrics and patterns, a star was born with this one! Can you tell from the photos which patterns they are? 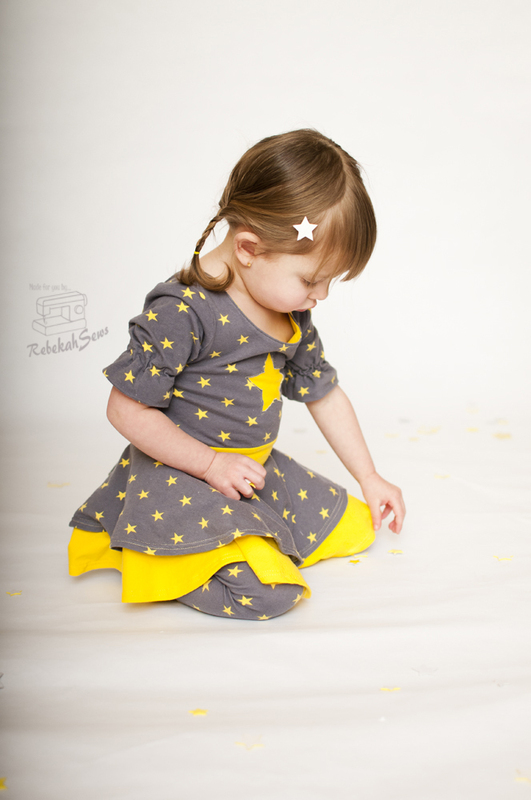 If you guessed Rebel Girl Party Dress, Adaline Dress, Kelly’s Twirly Skirt, and the Bow Tie Leggings then you get a gold star! Let me tell you a little on how I mashed them all up for this look. First I started with the Rebel Girl. I cut the bodice for length I wanted (18mo) with a width one size smaller (12mo). I followed the pattern instructions for constructing the bodice but left the arm cycle raw to attach the sleeves. From the Adaline Dress I used the short sleeves and cut the 18mo length again with 12mo width. They fit together very nicely especially since knit fabrics can give you ease even when this sleeve wasn’t made for the bodice. Next I moved onto Kelly’s Twirly skirt. This one I cut all 18mo pieces. Now for the waistband I cut my pattern piece in half length wise and then cut four of those. This is so you can sandwich the bodice in between the two waistband loops you created so that there is a clean finish all the way around. Finally I cut the BowTie leggings in an 18mo length and 12mo width. Now because you don’t need a waistband as these are attached to the skirt I needed to cut of the excess off the top of the pant. To do this I used the shorts pattern piece from the skirt pattern, laid it on top of the leggings pattern piece, lined up the rise points and cut off the excess of the leggings pattern piece where the shorts pattern piece stopped. Clear as mud? Then simply follow the instructions for Kelly’s to attach everything else together. This really was a pretty simple mash. To add an extra element of fun I did a reverse applique to the bodice. Finish it off with two snaps in the back and you have a Bella Sunshine Romper! This is such a fun mash up and I absolutely love it. Of course I couldn’t have done it without the inspiration and patterns from Bella Sunshine Designs*! All her patterns offer such flexibility and options that you can let your imagination run wild. Time to create your own star! 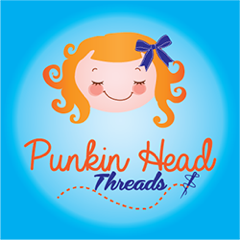 Hey there, it’s Chris with a special mash-up/pattern hack for Bella Sunshine Designs’* birthday! I have to admit, I struggle with thinking outside of the box, so this challenge put me a little bit out of my comfort zone. I’m more often a straightforward “do what the pattern says” gal, but I’m so pleased with how this turned out! For this dress, I used elements from the Holiday Cutout Dress & Top, the Sweet Lilly Pintuck Dress & Tunic, and Kelly’s Twirly Skirt (with Bowtie Leggings underneath - minus the bow, obviously!). I created the bodice in knit with eyelet trim using the Sweet Lilly bodice pattern pieces. I originally tried keep the pintucks in the bodice, but struggled with ironing crisp lines (there’s a reason this pattern was made for woven!). Instead, I folded the pattern piece along all of the pintuck lines and traced a new front bodice piece. I also added a little bit of length to both the front and back bodice because I left off the bodice band. Then I altered the Sweet Lilly back piece to be cut on the fold and eliminate the buttons and then used the Holiday Cutout Dress heart and directions to create the cutout. I did not have enough fabric to fully line the bodice, so I did a facing on the heart and a band for the neckline. I did have to trim down the neckline a bit to account for the change. Wonder-Under interfacing saved the day when the top of the heart kept wanting to curl up! Finally, I used Kelly’s Twirly Skirt for the ultimate twirl factor, which is by far my daughter’s favorite element of this dress. Because I was skipping the waistband and attaching the skirt to the bodice of the dress, I measured the bottom of the finished bodice and compared it to the measurement of the waist on the pattern piece to choose the waist size. For length, I had my daughter try on the bodice and measured to where I wanted the dress to fall and cut my pattern piece appropriately. All in all, I love results of this mash-up. The sweet elements of the lace on the bodice and the heart cutout in the back make me smile, and my daughter loves the comfort of the knit bodice along with the lightness (and twirl!) of the woven skirt. Happy Birthday, Bella Sunshine Designs*!We love celebrating with you! Join the party and follow along the tour! Bella Sunshine Designs - 2 Patterns of Choice Sofilantjes Patterns - 2 Patterns of Choice Knot Sew Normal - 1 Pattern of Choice Muffin Head Patterns - Any 1 pattern up to $12.00 Itch To Stitch - 1 Pattern of Choice Rachel Rossi - Squared Fashion Wrap Sewing Pattern FABulous Home Sewn - 1 Pattern of choice Seaside Notions - 1 pattern of choice Laela Jeyne Patterns - Pattern of choice (excludes bundles) Pickle Toes Patterns - 1 Pattern of choice. 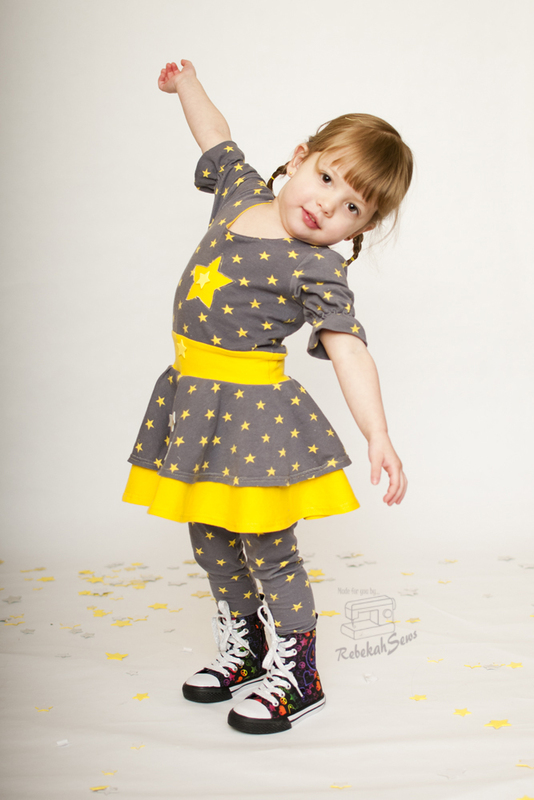 Mabel Madison - 10% off their website with coupon code BELLABIRTHDAY until February 29th. 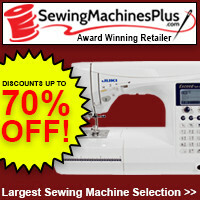 Sew It Seams - 15% off their website with coupon code BELLASUN until February 29th. 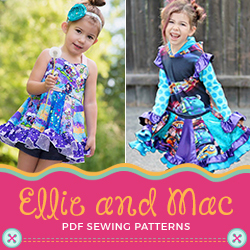 And of course, you can get 40% off all Bella Sunshine Designs patterns on our website* until February 29th. 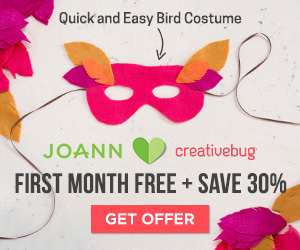 No coupon code needed! Ready for one more surprise? 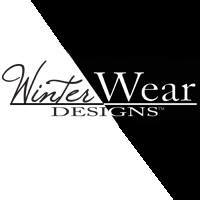 Check the Bella Sunshine Designs's website on Friday for a new release or two! Kari reviews the Sweet Lilly from Bella Sunshine.